We plan to implement startup tips and we are looking for good ones. I mocked up pictures of solution. We would like to implement panel with multiple fonts and links to web. It will be probably driven by XML similar to HTML, we don't have it yet, so the final solution may look different. Now you come, we need your help. Please share your best tips with us. You could do it by commenting here or on ticket or just send us email. 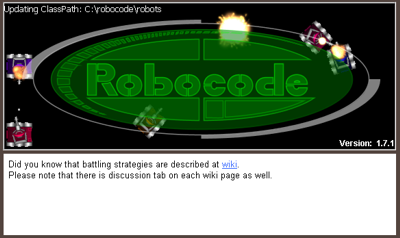 We would like to see nice, well formed, short, informative TIPs about Robocode. Robocode 1.7.1 has now finally been released. Bug  - Editor UNDO does delete the line when no is undo left. Bug  - Editor: Find/replace dialog (set cursor position). Bug  - roborumble.sh and teamrumble.sh were broken. Bug  - NullPointerException in BattlesRunner.runBattlesImpl. Bug  - Custom event priority was broken. The New Battle dialog is now larger per default. The layout of the View Options and Sound Options tab in the Preferences has been improved. An error dialog is shown when the input field for the desired TPS is out of range. Robocode 1.7.1 Beta 2 - few bugs left? We fixed more bugs for the version 1.7.1 Beta 2. There are a few bugs left that are not considered critical, and which will be available with the final 1.7.1 release. Please try out this version and try to find as many bugs you possible can and report issues on the tracker for Robocode. Bug  - Typing to find bot no longer works. Bug  - API: Typo in Documentation onBulletMissed(BulletMissedEvent). Bug  - Put back setTime() method of Event, the security is now handled other way, not by hiding the field. Fixed the problem with loading team robots from nested .jar files. On Ubuntu (Linux) the "Default window size" did not work properly. On SUN's JVM enabled caching of .jar files opened thru URLConnection. Solved problem with closing such files by implementing URLJarCollector. With this release we give BIG thanks to Nat Pavasant who have put in great effort in testing and finding as many bugs in Robocode as possible. He has been a great help with testing especially RoboRumble@Home functionality. Currently, there is one known issue, which will be fixed with the next Beta or in the final release of version 1.7.1. This is critical for e.g. the TeamRumble, so please notice the known issue below. With this version Robocode cannot handle team packages containing robot .jar files, i.e. robot packages. 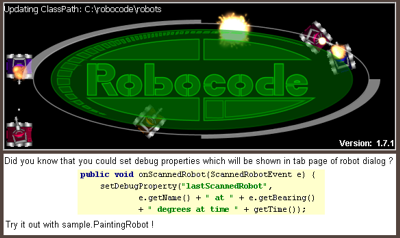 Bug  - Bots referencing robocode.robocodeGL broken. Now, we are now not following refrences to robocode packages. Bug  - Don't ever punish robots in devel directories by removing from repository. Bug ,  - Robot console was wrongly synchronized with battle. Bug  - Robot packager can be activated once per running. Bug  - Development robots cause problems with data files. Bug  - A battleview size exceed 800x600 filled with black. Bug  - NullPointerException when using -battle option from the cmd-line. Bug  - Robot Colors don't stick between rounds. Bug  - Open battle menu dialog is not loading robots. The command line usage of Robocode was not printed out at all when using the -? or -help option. Added getCurrentWorkingDir() + getRobotsDir() to the robocode.control.RobocodeEngine. Request  - Ranking Panel should be visible when Robocode is minimized. This feature has been added and it is possible to control the behavior from Common Options in the Preferences with the "Don't hide Rankings when main window is minimized", which is enabled per default. Request  - Command Line option for saving a battle record file. Two new command line options have been added for Robocode, i.e. - record and -recordXML . The -record option records the battle as a binary and zipped battle record. Here I propose that the specified filename should is something like record.br. The -recordXML does the same as the -record option, but saves the battle record as an XML file. Here I suggest that you use a filename like record.br.xml. Request  - Speedup time required for rebuilding robot database. Changed the link for http://rumble.fervir.com/rumble into http://darkcanuck.net/rumble as the RoboRumble server fervir is down and with unstable ranking. The current ranking at Darkcanuck's server is alive. Almost all clients are point to Darkcanuck's now. Hence, it is updated now. Update 3.3.2009: After discussion with both server owners we confirmed that old server will die soon. Big thanks to Pulsar for hosting it for us till now. The robot repository has been updated. It is no longer extracting .jar files. It also remembers last timestamp on file so detection of the changes is really fast. Only data files are extracted now. Data files for non-packed robots were moved to .robotcache as well. VersionManager is now able to detect if the Robocode version was upgraded since last run. Blocking security issue with relative path in getDataFile() method. BulletSnapshot has now method getBulletId which gives identity of bullet for UI.